The 2019 Ford F-250 may be the smallest of the Ford Super Duty trucks, but that’s kind of like saying someone is the smallest competitor in a Strong Man contest – sure it’s the smallest, but it’s still very powerful. In fact, the other Super Duty trucks are probably way more than a lot of people need, which makes the F-250 an attractive entry-level beast that can get a ton of work done without overloading your garage. That’s why we’re going to take a good look at this beauty and see everything it has to offer. First, we’ll take a look at the engine packed into this beauty and the available options for maximum power and performance. We’ll have a look at each trim level and consider what they have to offer, so you can decide on which model would really suit you best. This will include a range of interior features including not just the comfort and luxury of the interior itself but also the technological features inside the cab. Finally, we’ll talk about safety, because power shouldn’t come at the cost of a safe ride. There are two different engines to choose from with the 2019 Ford F-250, depending on just how much power you need packed into your pickup. The standard engine is a 6.2L SOHC 2-valve Flex Fuel V8 engine that provides up to 385hp and 430 lb.-ft. of torque, which gives you a ton of power and should be able to handle a wide range of needs. However, if you’re looking for more towing power and strength, then there is an available upgrade: a 6.7L Power Stroke V8 Turbo Diesel engine that offers up to 450hp and an incredible 935 lb.-ft. of torque. This is a super duty truck after all, so if you’re looking for a 2019 Ford F-250 that can tow just about anything and get you up any hill, then this engine upgrade should easily tick those boxes. But what does this actually translate to in terms of overall power? Well, when properly equipped for towing, the F-250 has a maximum towing capacity of 18,500 lbs. and a maximum payload of 4,270 lbs. If you need to pull more than that around behind you, then take a look at the Ford F-350 or F-450. When I’m looking at a lineup of trucks, cars, or SUVs, I like to see a lot of options. More options mean I can put together a vehicle that perfectly meets my needs and is exactly what I’m looking for. That’s one of the things I like so much about the 2019 Ford F-250: there are six different trim levels to choose from, including the Limited, and each of these includes its own selection of standard and available options. This is the starting point for the 2019 Ford F-250, which is great in and of itself but also somewhat barebones, as you would expect from an entry trim level. It includes some basic features like automatic headlamps and hill start assist, along with a couple interior power outlets and vinyl seating. There’s a 2-inch productivity screen with the instrument cluster and a basic stereo package. Available features for the Ford F-250 XL include cloth-trimmed seats, additional outlets, and a rapid cab heater. There are available packages including a Power Equipment Group for easier control over mirrors and windows, and an Appearance Package that includes exterior and interior details. An 8-inch LCD touchscreen Infotainment system is also available but does not come standard at this level. The 2019 Ford F-250 XLT effectively builds upon the foundation of the XL and includes a number of additional features. The XLT has cloth-trimmed seating, a 4-inch LCD productivity screen, and cruise control with power door and tailgate locks. It includes an entertainment system with a 4-inch color LCD screen. Available features for the XLT include a trailer tow hitch for better towing capacity, a voice-activated Navigation system, and additional lighting features inside and out. An 8-inch touchscreen upgrade for the entertainment system is available, as are numerous safety options. You can choose different packages at this level including a Premium Package that provides a number of upgrades. As you would expect, the 2019 Ford F-250 Lariat continues to build upon the XL and XLT and includes leather-trimmed front seating, power-adjustable seats, and vinyl or leather-trimmed rear seating. A Bang & Olufsen 10-speaker premium sound system is standard with the Lariat, as is an 8-inch LCD productivity screen, and auto-dimming rearview mirror. Additional exterior details include chrome step bars, halogen fog lamps, and a keyless entry pad. Available options for the Lariat include heated rear seats, voice-activated Navigation, and floor liners. There’s also a universal garage door available, along with a remote start system, and a tailgate step. A Chrome Package is available for the Lariat, which includes numerous exterior details, along with LED lighting upgrades, and a Sport Package. The 2019 Ford F-250 King Ranch really takes things a step further with included details such as a memory-enabled driver’s seat, heated and cooled front seats, and voice-activated Navigation standard. This trim level includes a heated steering wheel, power-adjustable pedals with memory, and a remote tailgate and remote start system. Available features for the King Ranch include several trailer towing hitch options, such as a gooseneck, and heated rear seats. Premium floor liners are available, as are a trailer camera and a tailgate step, as well as different bed liner options. Most safety options are included at this level, though there are still a few available upgrades, and there are several different packages to choose from including a Chrome Package and Monochromatic Paint Package for exterior customization. The 2019 Ford F-250 Platinum also builds upon the features of the Lariat but goes beyond what’s included with the King Ranch. The Platinum includes heated and cooled front seats, heated rear seats, and a memory-enabled driver’s seat. It has a heated steering wheel, a universal garage door opener, and voice-activated Navigation. You also get LED exterior lights, chrome details, and adaptive steering at this level. While most features are already included with the Platinum trim level, there are still a few available options. These include cameras for the trailer, premium floor liners, and different trailering options. There is also a Platinum Ultimate Package available, which pretty much upgrades every aspect of the Ford F-250 to the highest level. Finally, there is the 2019 Ford F-250 Limited, which also builds upon the Lariat and includes the most standard features possible. This includes heated and cooled front seats, heated rear seats, voice-activated Navigation, and a heated steering wheel. Chrome details and LED lighting are included, as are a tailgate step, trailer tow camera system, and blind-spot information system. The Limited essentially has the full suite of Ford safety features included. There are still a few available options with the Limited, however, including trailer tow choices, floor liners, and bed liners. Overall, however, the Limited has pretty much everything you would want already included, with just a few extra details to consider. There are a number of great safety features available on the 2019 Ford F-250, but keep in mind that many of these are available options at most trim levels. These safety features include adaptive cruise control, adaptive steering, and a lane-keep alert. When towing a trailer, the F-250 can include individual trailer tire pressure monitoring, a blind-spot information system with trailer coverage, and trailer sway control. All of this comes together in the 2019 Ford F-250 to create a strong, impressive, pickup that can get just about any job done and still keep you safe. What’s New For The 2019 Ford Edge? Pickup truck lovers, Rejoice! 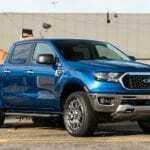 The 2019 Ford Ranger is coming!